Need a custom solution for routing inbound calls? VoIPTools has created many custom routing solutions. Whether you want to route calls based on geography, or assigned agent, or account number, or route VIP customers to a priority queue, VoIPTools has a solution for you. Take control of how your organization's inbound phone calls are routed using a solution from VoIPTools. 3CX Call Router isn't technically an individual product, rather it is a collection of routing solutions we have developed over the years. If you have a unique routing need, not satisfied by one of our existing routing solutions, we can build a custom solution for you. You don't have to settle for the built-in routing options provided in 3CX. We have many routing solutions available, or we can build a custom solution for your specific business's situation. 3CX provides powerful tools we can use to build exactly what you need. 3CX Call Router is a collection of phone routing solutions. We can tailor a solution that meets your specific business needs. Call Flow Designer applications enable us to build highly customized routing solutions based on any number of criteria. Effectively, we can build a customized version of 3CX to meet your customer's needs. This solution extracts the Area Code from the inbound Caller ID number, looks up the area code in a database, obtains the corresponding extension and routes the call to this extension. This solution compares the current date / time to a On-Call schedule. If the call is within the scheduled support hours / days, the call is forwarded to the scheduled employee, otherwise the call is forwarded to voicemail. Need to know when and how a delivery was made? Our driver-delivery tool keeps you up-to-date on the delivery status by routing driver calls to an IVR that prompts for the driver code, order number, and delivery status so you know your delivery status instantly. Do you have customers flagged as a VIP or priority support customer? We can route your most important customers to a priority queue, while routing other customers to the standard queue. Whether routing calls to the correct agent based on area code, account number, ticket number, previous agent, or priority status, with a routing solution tailored to meet your specific business needs, your customers avoid the run-around. You don't have to settle for a static route for all calls, rather, calls can be routed based on any number of factors -- you define the criteria and we build a dynamic solution for you. Nothing is more frustrating for your customers than to be transferred from one place to another in an effort to find the "right" person within your organization. We can help your customers find the right person the first time with a routing solution from VoIPTools. Route By Area Code: This solution extracts the Area Code from the inbound Caller ID number, looks up the area code in a database, obtains the corresponding extension and routes the call to this extension. Route By Caller ID (Prompt for Authorized Number): This solution captures the inbound Caller ID number, looks for the Caller ID in a database and if found routes the call to the support extension. If the Caller ID is not found, it prompts the caller to enter in the authorized phone number. The caller is given a number of attempts to enter the correct number, and will route the call to voicemail if unsuccessful. Route By Caller ID (Simple): This solution obtains the inbound Caller ID and if found in a database, routes to a specified extension and if not found routes the call to a “default” extension. Route By On-Call Schedule: This solution compares the current date / time to a On-Call schedule. If the call is within the scheduled support hours / days, the call is forwarded to the scheduled employee, otherwise the call is forwarded to voicemail. 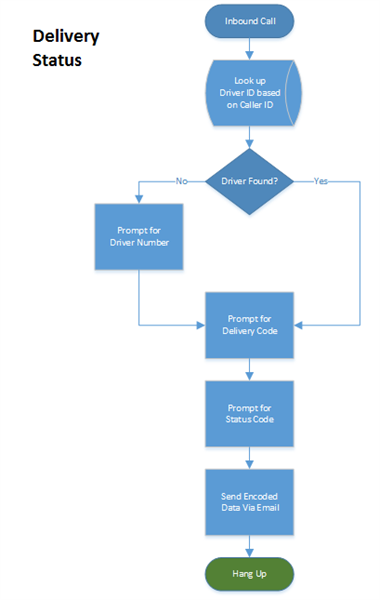 Delivery Status: This solution looks up the Driver based on Caller ID, prompts for several pieces of information, then builds and sends an encoded email. The email is then imported into a CRM to update the order status. Custom Solutions: Don’t see what you need listed? Contact us today to discuss your requirements. We can often have a solution ready for you in just a few short hours! Your solution can be surprisingly affordable. How does 3CX Call Router Work? 3CX Call Router solutions are written using the 3CX Call Flow Designer (CFD). CFD applications are designed to enable you to manipulate INBOUND phone calls. When installed, a CFD application is assigned an extension and you forward inbound calls to this extension just as you would any other call. When the call is received at the assigned extension, the CFD application processes the inbound call.